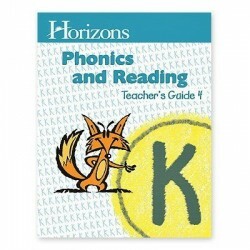 Horizons Kindergarten Phonics and Reading Teacher's Guide 4 includes answer keys and a resourceful daily lesson planner for Student Book 4. The planner for each lesson includes: an overview, materials and supplies needed, teaching tips, and workbook activities. The invaluable teacher's guide also includes a scope and sequence.